The heavy metal machine from Belgium FIREFORCE explode everything with its debut. The quintet has a genetic connection to the veterans from DOUBLE DIAMOND, but the current release is made in a qualitatively different approach. The voice of Flype strongly reminds Frank Knight and in combination with the guitars, set on forward as sound, the gender of the band is similar to the best songs of X WILD. The music of FIREFORCE gathered in itself the fury of GRAVE DIGGER from the period of the rebirth 1991-1993. We have here only fast songs and power metal riffs with the strength of “Hail to <?xml:namespace prefix = st1 ns = "urn:schemas-microsoft-com:office:smarttags" />England” of MANOWAR. The double guitar attack is on the front of the sound – just how exactly heavy metal should sound from its very beginning! Galloping rhythm… Hoarse and pure voice which imposes the intention of the lyrics. There are no unnecessary melodies, prog-influences or ballads! This picture becomes almost perfect with the closing trilogy, devoted to the glorification of heavy metal. “Born to Play Metal” connects the band to the debut of HELLOWEEN “Walls of Jericho” into a storm of speed and immortal hymn. 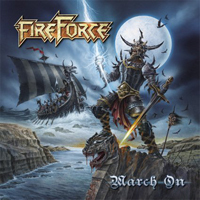 FIREFORCE prepared their appearance with an EP dating from 2009. The songs from this EP are in their album as well. The perfect logo and cover artwork made by Eric Philippe are also impressive. It is one orderly implementation, but the result is brilliant. It will not be a mistake if the band pays more attention on the diversity. But I am sure that in their next release this will happen. This is a serious application for a debut of the year in my personal collection. I recommend “March On” to fans of all sub-genders in metal, just because it is excellent.